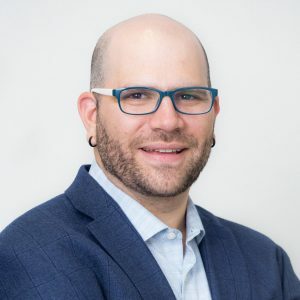 Coming in the wake of President Donald Trump’s March 24, 2019 Executive Order on campus speech, Chasm in the Classroom: Campus Free Speech in a Divided America debunks the Administration’s constricted account of free speech threats emanating only from the left, and details an array of infringements on speech, both official and informal. The report, executive summary and accompanying “PEN America Principles on Campus Free Speech” offer guidance to faculty, administrators, and student leaders on how robust protections for free speech can be reconciled with the need to forcefully address bias and bigotry. Busting myths, caricatures, and misinformation that characterize much of the public discourse on campus free speech, this nearly 100-page original research report offers a hard-hitting analysis of more than 100 speech-related controversies of recent years, finding that many implicate tensions among free speech, equality, and inclusion, in the classroom, the dorm, and the quad. Bringing up to date the analysis in PEN America’s groundbreaking October 2016 report, And Campus for All: Diversity, Inclusion, and Freedom of Speech at U.S. Universities, Chasm in the Classroom scrutinizes recent trends, including the rise of hateful speech and incidents of bigotry on campus; shutdowns and disinvitations of controversial speakers; outrage campaigns against faculty members for their speech; the mixed views of a new generation of students on issues of free speech and hate speech; and the perils and pitfalls of federal and state legislative measures purportedly aiming to protect free speech in polarized campus environments. 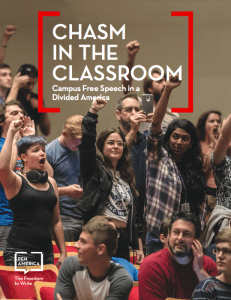 Chasm in the Classroom is informed in part by four closed-door convenings PEN America held during the 2017-2018 academic year on campuses that had been flashpoints for free speech controversies: UC Berkeley; University of Virginia at Charlottesville, Middlebury College, and University of Maryland at College Park. PEN America brought together a diverse group of students, faculty, administrators, and other stakeholders for intensive face-to-face discussions, giving all stakeholders and perspectives their due and fostering empathy, understanding, and shared purpose across dividing lines. As we discuss in the report, there is much work to be done to educate the rising generation about the importance of free speech as a bedrock principle to an open, democratic society. Promoting greater dialogue, understanding, and awareness of the First Amendment on campus, and providing a forum to examine tensions that entwine racism, diversity and inclusion, may go a long way to helping de-escalate many of today’s most intractable social and political conflicts.